It’s been two-and-a-half years since the introduction of the Apple iPhone, nearly a year-and-a-half since the launch of the first Google Android phone and a year since the unveiling of the Palm Pre – all devices running innovative operating systems that have dramatically upgraded the capabilities and features of mobile phones. There are two obvious names missing from that list – Nokia and Microsoft. The former yesterday announced it was merging its Maemo mobile OS with Intel’s Moblin to create Meego. Microsoft has produced a smartphone OS since 2000, but recently Windows Mobile has seemed to be reaching the end of its life. It has suffered decreasing marketshare, has been abandoned by major phone manufacturers such as Samsung, and was reportedly branded a screw up by Microsoft CEO Steve Ballmer. Yesterday at its press conference at the Mobile World Congress trade show in Barcelona, Microsoft consigned previous versions of Windows Mobile into the recycle bin as it announced a brand new mobile OS, Windows Phone Series 7. On the surface, the new OS shares very little – if anything – with previous versions of Windows Mobile. It boasts a brand new user interface with a heavy emphasis on social networks and cloud services, plus tight integration with other Microsoft services and brands such as Office, Bing, Xbox Live and Zune. The interface is based on the a UI concept Microsoft calls ‘metro’, characterised by flat squares, oversize type and large, horizontally scrolling panes of data that was first seen in Media Center, and then developed for the Zune HD. It’s no surprise that key members of the team behind the new OS came from the Zune and Xbox teams. The UI eschews the grid of regular sized squares linked to specific functions – the approach taken by the iPhone – and is instead focuses on various hubs that group features by the data they relate to. For instance, status updates, addresses and phone numbers for contacts are all grouped together in the People hub, so you don’t need to open one app to see Facebook updates, and then another to see email and text messages from that same person. The hubs themselves are large panoramas which you scroll horizontally though – a bit like a gallery with data, programs and images hung on the wall – the idea being that this reduces the endless chopping-and-changing between apps that Microsoft appears to be pin-pointing as a key weakness of the iPhone’s UI. The Games hub integrates Xbox Live – so you can see your avatar, achievements and Xbox friends. Little was said about what actual games might be available though, with further details promised by Microsoft at the MIX 10 conference in mid-March. With the iPhone now representing a significant gaming platform, it’s no surprise that gaming appears to be a key part of Series 7. Zune is also part of the new OS, forming the “music+video” hub. Office is also built into the phone, although it’s not clear yet exactly how functional it will be, and there’s integration with a variety of Bing services including maps, and the OS is capable of WiFi syncing. Essentially, if it’s a big Microsoft brand, it’s got a part to play in Series 7. 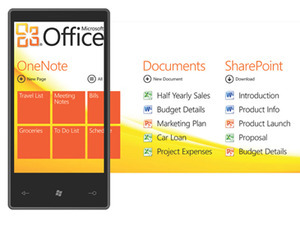 Microsoft is also radically changing its own business model for Windows Mobile. Previously, the company licensed it to a wide range of hardware companies who had a lot of freedom in designing the device and in customising the software. With Series 7, Microsoft has a long list of mandatory hardware requirements - a capacitive, multitouch-compatible screen with at least four points of touch, accelerometer, 5-megapixel camera and FM radio all need to be present. A keyboard is an optional extra. All phones will have a search and start button, with the search key set to take you straight to Bing. Only select hardware manufacturers are being invited to make Series 7 phones, although unlike Android, hardware manufacturers will still have to pay a license fee to Microsoft for the software. If you want a closer look at Series 7, a trailer is embedded below. For a more comprehensive view, a 22 minute demo is available on Microsoft’s Channel 9 blog. Excited by the chance to bring a bit of Xbox, Bing and Office to your phone, or is it too little, too late from Microsoft? Let us know your thoughts in the forums. Microsoft's Achim Berg reveals that 1.5 million Windows Phone 7 handsets have shipped. 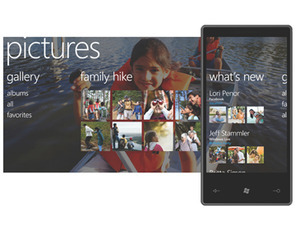 Microsoft has officially launched Windows Phone 7, with a major focus on the cloud and gaming.